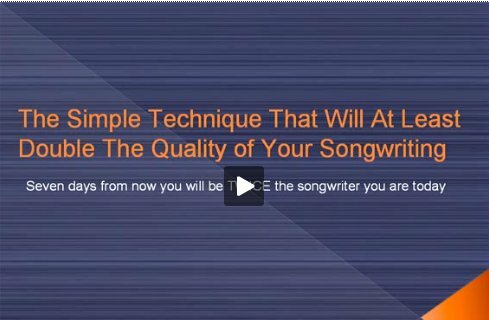 Click here to watch this article in video form, how to write a melody that dazzles your listeners. To view the first part of this article, click here. Now for irresistible melody technique number two. This is actually quite similar to the first one. The idea for this technique is to use a music backing as you brainstorm melody ideas. What you need to do is take a musical idea that you’ve created and then bring it into a recording program and loop this idea for around 20 to 30 minutes, so the same idea plays over and over. Once you’ve got this set up, play this through and while you’re listening to the musical idea just begin allowing melodies to come to you. Hum these into a microphone and capture them onto a second track. The same rules as for technique number one apply to this. You must be completely non-judgmental. Here’s a small example that highlights the attitude that you need to have while you’re doing this technique. Let’s just pretend that you have absolutely no talent as a visual artist, but you sort of enjoy it and from time to time you like to draw little doodles on a piece of paper. Because you know you’re not at all talented at this, you don’t really care about the results. It’s just a bit of fun and you’re not attached to the results at all. This is the exact attitude you need to have while you’re creating these melodies. You need to forget about being attached to the result and strangely enough when you lose this attachment your best ideas are going to come to you. Do this for technique for 20 to 30 minutes. Simply hum the ideas that come to you over this musical progression. One you’ve finished, stop the recording and take a break for half an hour to an hour and then come back and listen to the ideas. I’m positive you’ll find some excellent melody ideas that you can use in your songs. To go to the next part of How To Write A Melody That Dazzles Your Listeners, click part three below.